The Minnies and I have been celebrating and remembering the War of 1812 all year. Earlier this year, the girls researched Maryland war heroines for a War of 1812 essay contest; Alexia won! Participants had to relate the experience of a war hero to their own lives and the significance of these heroic actions now. Later, we watched the fanfare at Baltimore's Sailabration this summer. Now in September, 200 years after America secured its standing as a truly independent nation, American Girl’s newest historical character, Caroline Abbott, shows girls today how to stay steady and believe in themselves during difficult times. Caroline, an independent and adventurous nine-year-old girl whose story is set near Lake Ontario during the War of 1812, learns to face her most challenging moments using her heart as her compass. Going above and beyond to help those around her, Caroline gives of herself without expecting anything in return—becoming the kind of real everyday hero that any girl can be. Although the minnies love all American Girl dolls, the historical dolls are their favorites. The stories about Felicity's life during the American Revolution added a new dimension to our trip to Williamsburg, Virginia. Kit's experiences shed light on difficult economic times and are a conversation topic at our home often when we hear about the difficult economy. As a 70s baby, the girls delight in my stories about my own banana bike just like Julie's. We're eager to learn more about Caroline and the period during the War of 1812. Of course, the minnies are also pretty thrilled that Caroline Abbott has beautiful hair. “Our newest historical character, Caroline, is a brave, independent girl who teaches girls today that they can navigate life’s challenges by staying strong, making good decisions, and taking action,” says Jean McKenzie, executive vice president of American Girl. “We know our fans will be inspired by the stories of Caroline, who shows girls that they can set their own course to help make changes for the greater good.” Caroline launches with six historical books written by author and social historian Kathleen Ernst. The book series includes Meet Caroline, Caroline’s Secret Message, A Surprise for Caroline, Caroline Takes a Chance, Caroline’s Battle, and Changes for Caroline; a beautiful, 18-inch Caroline doll featuring butter blonde hair and light blue eyes; and an array of historically accurate clothes and accessories that represent Caroline’s time period. Isn't her parlor adorable? The Caroline doll, books, and accessories will be available on September 4, 2012, through American Girl’s catalogue, at americangirl.com, and at American Girl retail locations. 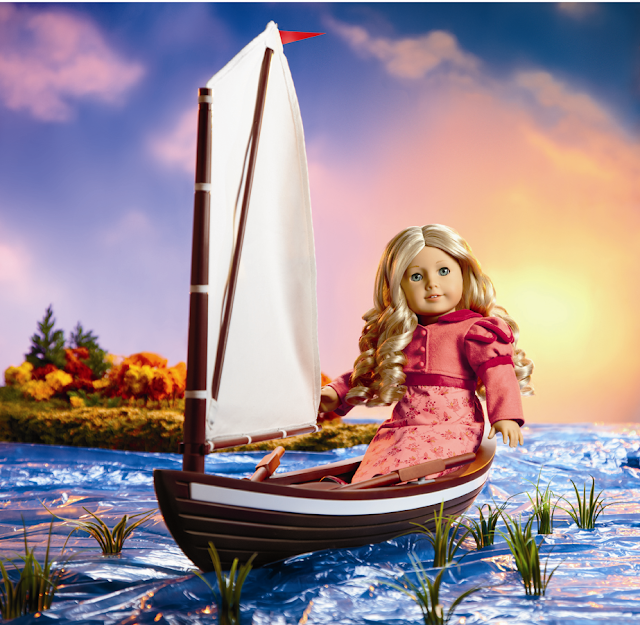 To request a free catalogue, call 1-800-845-0005.
Who is your favorite historical American Girl? What historical doll would you like to see in the future? Kit is my personal favorite. She reminds me of my beloved MaMa (Mom's mother). My minnie is very excited about Caroline as well. We have a trip to the store planned, and I have a feeling Caroline may come home with us. She's been saving all her money for months now. I used to LOVE my American Girls! They provided me with hours and hours of entertainment when I was younger. I always loved Kit the most because she had short blonde hair like me. When I was babysitting a few weeks ago I flipped through their American Girl catalog and was shocked at how many changes they've made (some of my favorites are no longer available). So sad to see them discontinued but this new addition is adorable! Hope your girls enjoy her! I love her. She is beautiful! Love the story, the sailboat, and her parlor! I want one for myself. My daughter is too old. I wish she was around when my girl was young and into American Girl dolls! I was so into american girls! LOVE the new girl! I am going to buy these for my future girls!